Now that winter seems to have finally arrived, we will soon be seeing some harbingers of spring; the nodding flowers of hellebores. There are approximately 15 species within the Helleborus genus. The most commonly found are Helleborus niger (Christmas rose) and Helleborus orientalis (Lenten rose), most cultivars found in stores are hybrids of Helleborus orientalis and are listed as Helleborus x hybridus. Despite its common name it is not closely related to the rose family. In spite of its beauty and other attractive attributes, hellebores have a checkered past. It is a very toxic plant and in fact, one can develop skin irritation from prolonged exposure when working with or weeding around the plant (so long sleeves and gloves are recommended). One of the first documented uses of chemical warfare was during the Siege of Kirrha (mainland Greece) in 585 BC. Hellebore was reportedly used to poison the water system leading into the city, the residents fell ill and were no longer able to fight, and the City of Kirrha was lost. Hellebore poisoning has also been a suggested cause of death of Alexander the Great. While some species are native to Asia, the majority of species originated in the Balkan area of Europe. Because the plant easily hybridizes, there is a wide variety in the cultivars available in the marketplace. The buttercup-shaped flowers can range from pure white to dark purple, almost black. There are also multiple shades of pink, green, yellow, and red available. Some cultivars have picotee flowers, meaning that the color along the edges is darker, while others have interesting color patterns. The flowers are usually between 3- to 4- inches wide. Hellebores are somewhat difficult to start from seed, so generally 2-3 year old plants are purchased. When planting, choose a site with well-draining soil and incorporate compost throughout the planting area. Plants should be spaced about 16 inches apart or more. The plants are best left in place and the “clump” will get bigger every year. Mature plants will be 18-24 inches tall and 24-30 inches wide. You will be rewarded with new seedlings that appear in the spring which might even be a new color combination than the mother plant. They need little fertilization, a spring application of compost or light sprinkle of a slow release fertilizer should suffice. Hellebores are a must for shaded areas and deer will avoid the plant. Once established they are low maintenance and rarely need to be divided. For these reasons, the Perennial Plant Association named it “Perennial Plant of the Year” in 2005. They are perfect as both specimen plants and borders. The foliage of the plant is palmate-shaped, shiny leaves that are attractive in their own right. 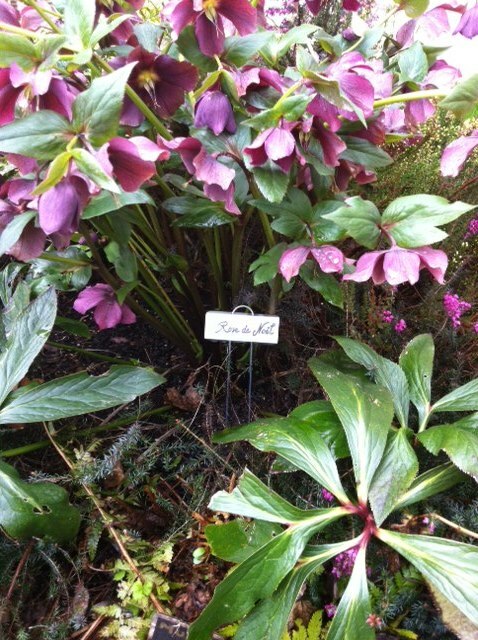 Good companions to hellebores are other spring bulbs and plants with contrasting foliage such as ferns and hostas. It is one of the first plants to bloom in the spring. In the first couple of years of establishment, the plants will produce few flowers, but once established it can produce up to 50 flowers per plant. Because the “petals” are actually sepals, they will not fall off of the plant quickly and the flowers can last for up to two months on the plant. An interesting seed pod will develop. The vase life of hellebore is long, but flowers should not be harvested until the stamens (where the pollen is located) fall off and the flower feels papery and stiff. While usually hardy to our zone, if unexpected harsh spring weather may damage flowers and leaves, just remove and the plant will quickly send out new growth. Once you have incorporated these beauties in your landscape, you will wonder how you even did without them.